A row of single-story storefronts containing five businesses along 31st Street in Astoria was sold for $7.2 million. 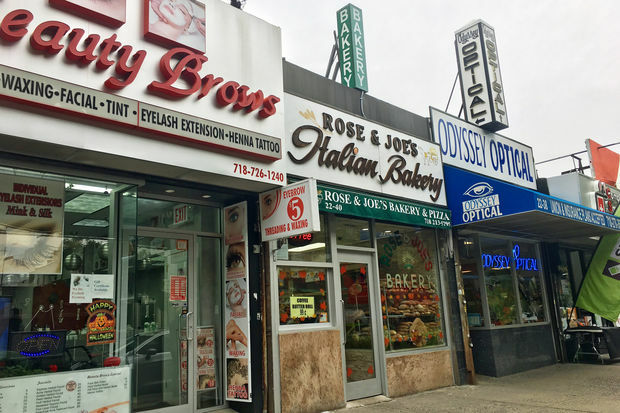 DITMARS — A row of single-story storefronts containing five businesses — including the decades-old Italian bakery Rose and Joe's — was purchased by a new owner for $7.2 million, according to property records and the realtor who brokered the sale. The buildings — located mid-block on 31st Street between 23rd Avenue and Ditmars Boulevard — house the bakery, Odyssey Optical, Computer and Smartphone Repair, Beauty Brows and Astoria Smoke Shop. The properties were purchased by Amorani LLC from previous owner PJH Astoria Realty LLC for $7.2 million in a sale that closed on Sept. 18, city records show. Swain Weiner, a partner at Greiner-Maltz Real Estate who represented both parties in the deal, said the new owner isn't planning to make any changes to the property and that the existing businesses will remain. Rose and Joe's owner Anna Porretto said she was aware of the sale but that it won't interfere with the shop, which has been in operation for nearly 40 years and is known for its baked goods and Sicilian pizza. "It didn't affect anything," she said. "We're staying put."